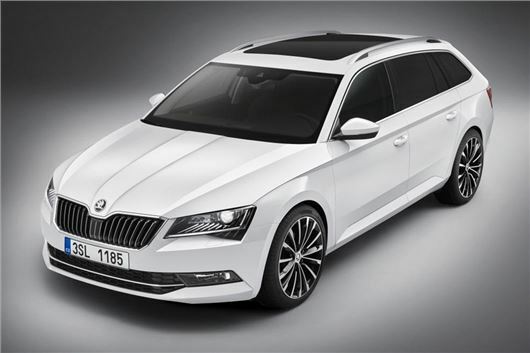 Skoda has released pictures and details of the new Superb Estate, which will make its public debut at the 2015 Frankfurt Motor Show. Full details are to be confirmed, but the maximum load volume is 1950 litres, which is significantly ahead of rivals like the Ford Mondeo, which has a maximum volume of 1630 litres. Prices are to be confirmed, but are expected to start at around £21,000. With the seats in place the Superb Estate has a maximum load capacity of 660 litres, which is up 27 litres over the previous model. The engine range is to be confirmed but expect similarities with the saloon. Buyers should be able to choose from 1.4-litre and 2.0-litre petrol engines, along with 1.6-litre and 2.0-litre diesel engines. Buyers should be able to get all-wheel drive and can pick between manual or DSG automatic transmissions. As with the saloon there is plenty of technology on offer including infotainment with MirrorLink and Apple CarPlay, which lets drivers safely use mobile phone apps when driving. There is also a high speed internet option that makes the car into a WiFi hotspot. Full details including the engine range and final prices should be announced nearer the Frankfurt Motor Show in September.